Mom Who Gave Birth on I-15: "There Was No Stopping This One"
As a mother of three boys, it's probably difficult to surprise Katie Ashcraft . Tell that to her fourth son who arrived earlier than anticipated and surprised his parents alongside a San Diego highway Thursday. Ashcraft and her husband were on their way to UCSD Medical, driving on Interstate 15 near State Route 56 when they realized the baby not due for another 10 days just wasn't going to wait a minute longer. "Something was different," she explains. "It was really intense." "There was no stopping this one." After Ashcraft's water broke, it was a matter of minutes before the baby was crowning and her husband was worried. "It was complete chaos for about 20 minutes," she said. The couple pulled over and called 911. 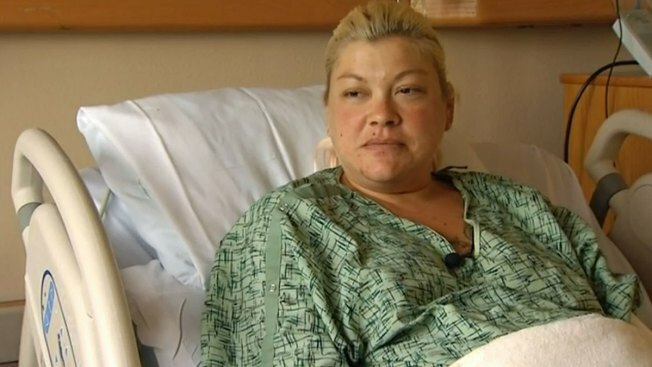 Within minutes the California Highway Patrol and San Diego Fire Rescue crews arrived and helped her deliver the baby. NBC 7 captured the new mom as she was transported to Sharp Mary Birch Hospital after the 2 a.m. delivery in the back of the couple's pickup truck. Baby boy Ashcraft weighed in at a healthy 10 pounds, 14 ounces. His mother described this delivery as night and day when compared to her previous deliveries. With each of her three older sons, she had the time to receive an epidural. "I don't know how I survived," she said. She appeared calm when she invited NBC 7 to speak with her in her hospital room despite the chaos of the morning. Able to laugh about it later, she said the only good thing about the birth was that it was fast. She was also grateful everything worked out well since she lives with Type I Diabetes and is usually monitored closely when pregnant. "This was a complete 360. I never would have imagined," she said. The baby was a little bruised up because he was delivered so quickly, his mother said, but he's healthy and doing well in the care of the doctors at the hospital. Ashcraft said she hopes to do something to thank the emergency personnel who helped her safely deliver. The people she called her heroes.